Automotive Wheel Market size was around USD 82 billion in 2017 and will witness growth at around 3.0% CAGR up to 2024. Increasing vehicle production along with proliferating consumer preference for comfort and fuel-efficient vehicles will propel the automotive wheel market size over the forecast timeframe. Choice and utilization of appropriate wheels based on vehicle models, size, and price specifications form an integral part of the vehicle layout. Economical pricing, heavy load carrying capabilities, lower weight, and resistance to corrosion from external factors are among the prominent features that will continue to aid the manufacturers in gaining increased consumer acquisition through the forecast period. Rising vehicle ownership and registrations across the globe, owing to increasing disposable income are playing a major role in the industry expansion. Moreover, high penetration of auto finance companies, with easier leasing and credit availability are positively influencing the automobile ownership growth. Improved vehicle aesthetics in conjunction with performance improvement achieved through high performance and customized wheels, are expected to favour the automotive wheel market size over the study timeframe. Stringent emissions and fuel economy regulations are driving the requirement for utilization of lightweight components in vehicles. For instance, the EU is committed to reducing at least 20% CO2 emissions by 2020, generating increased installations requirement for aluminum alloy wheels. Increasing consumer inclination towards car individualization from automotive manufacturers including diamond cut and gloss paint wheels are further expanding the automotive wheel market growth till 2024. Stringent regulatory compliance and trade tariffs for manufacturers and suppliers may hamper the market growth. For instance, the U.S. government implemented trade tariffs from June 2018, imposing 25% tariff on steel and 10% tariff on aluminum imports. 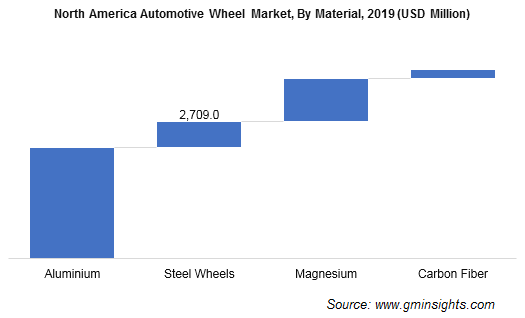 Additionally, higher costs involved with raw materials and factory set-up may further restrict the automotive wheel market penetration till 2024. Utilization of aluminum, carbon composite structures, and magnesium for manufacturing automotive wheels improves their performance capabilities in conjunction with weight reduction. For instance, in March 2015, DSM and ESE Carbon Company collaboratively introduced light carbon fiber wheels that have higher axle load carrying capacity. This reduces acceleration time, improves handling, fuel efficiency, and offers relatively smooth rides. The growing demand for specified requirements with respect to diameter and material suited for different vehicles will further boost the market share. Aluminum automotive wheel market segment accounted for the maximum share in 2017. This share is primarily attributed to the benefits offered by the material including lower weight, superior heat conductivity and improved anti-corrosion properties. Amendments in regulatory policies to promote fuel-efficient vehicles are encouraging automobile OEMs to invest in R&D and introduce light weight wheels, positively influencing the market share till 2024. Steel wheels witnessed a demand of over 150 thousand units in 2017. Lower costs of the car wheels along with easier availability across a wide network of dealerships across the globe are boosting the industry share over the projected timeframe. Additionally, the standard fitment of steel wheels across multiple vehicle models along with improved durability and easier repairability are augmenting the market size till 2024. Increasing car sales in emerging economies is expected to positively influence the regular automotive wheel market growth. OEMs are expected to remain the largest consumer segments owing to a significant emphasis on offering budget vehicle models for price-sensitive consumer segments. Lower maintenance, cost-effectiveness, high durability, and easy availability at automotive outlets in conjunction with optimum performance output will drive the segment growth over the projected period. OEMs is expected to dominate the automotive wheels market share over the forecast period. Increasing automobile production is among the prominent factors fuelling the segment demand. According to the International Organization of Motor Vehicle Manufacturers (OICA), as of 2017, the global vehicle production accounted for around 97.3 million units, and Asia Pacific contributed for over 50% of the total global production. Rising vehicle ownerships along with continuous support from the government for adoption of alternative fuelled vehicles are further supporting the automotive wheel market expansion till 2024. Automotive wheel aftermarket is set to witness around 5% CAGR over the projected timeframe. Increasing average vehicle age and proliferation of online B2C automotive parts and accessories sales are among the key factors expanding the aftermarket growth. Moreover, increasing ease of aftermarket accessibility along with increasing adoption of online web portals for component sales are further propelling the automotive aftermarket wheel market share over the forecast period. 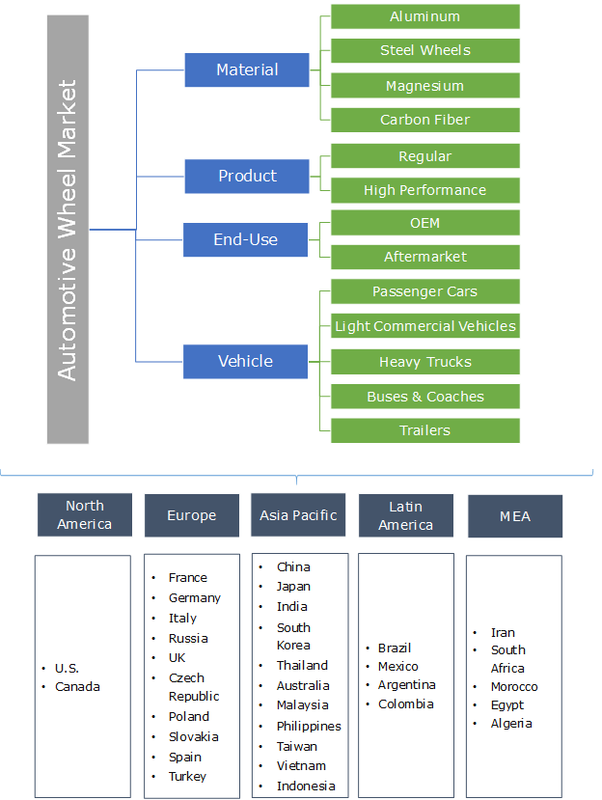 Passenger cars accounted for over 70% of the global automotive wheel market share and are expected to dominate the industry share during the forecast period. Passenger car OEMs are increasingly adopting concave European designs and machined faces coupled with clean lines and styling for optimum vehicle performance and aesthetics. Moreover, industry participants offering milled window designs and painted products have witnessed considerable surge owing to growing demands for these types of finishes. Ease of aftermarket availability of these products will provide strong support to the industry growth. LCVs accounted for a revenue share of around 20% in 2017. Advent of hub & spoke model in emerging economies are providing lucrative opportunity for the sales of goods carriage and transportation vehicles. Moreover, the requirement to sustain impact of the potholes and unevenness will favour the deployment of strong and robust automotive wheels in the LCV segment. North America accounted for around 15% volume share in 2017. Presence of multiple automobile OEMs offering a wide range of models including Ford, Toyota, Volkswagen, Hyundai, and Honda are further supporting the regional growth. Intense competition among the vehicle manufacturers in turn will drive the requirement for investment in the innovative material composition and finishing of automotive components. For instance, in 2017, Superior Industries International invested USD 7.7 Millions in R&D to promote the development of cost effective and efficient automotive wheels. Asia Pacific automotive wheels market share is expected to witness over 4.0% CAGR through the forecast period. Requirements for capitalization on the growing demands and setting up of new manufacturing plants in emerging economies including China and India are driving the regional demand. For instance, in March 2018, Steel Strip Wheels set up a manufacturing facility in India for manufacturing steel wheels. This will help the company improve its presence in the commercial vehicles and tractor segment. Some of the key players in the automotive wheel market place include Maxion Wheels, Changchun Faway Automobile Components Co., Ltd., Ronal Group, Zhejiang Wanfeng Auto Wheel, Titan International, Inc., Topy Industries Limited, Borbet GmbH, and Superior Industries International, Inc. Industry participants are investing in R&D for developing new technologically advanced products to increase their market share. For instance, in 2015, Ford redesigned its F-150 pickup and integrated the vehicle with Alcoa’s proprietary Micromill technology with highly durable and lightweight materials. Industry participants are expected to witness an intensive competition owing to the adoption of aggressive strategies including mergers & acquisitions, new product developments, and portfolio diversification by competitors to gain high visibility in the market place. For instance, in June 2018, Accuride Wheels completed the acquisition of Mefro Wheels GmbH. This enabled the company to increase its foothold in the European and Asia Pacific market. High product durability and ease of product replacement from the unorganized sector are among the major factors supporting the automotive wheel market growth. Integrating performance wheels and high-end finished components for better vehicle aesthetics are expected to present considerable growth prospects.